Port Colborne, ON – This fall, dozens of communities across Ontario will take part in a curbside collection to recycle single-use household batteries. The bi-annual program is a partnership between 62 Ontario municipalities, Raw Materials Company and Stewardship Ontario and is funded by the battery manufacturers. The program has helped Ontario residents recycle hundreds of metric tonnes of batteries at the curbside each year, diverting harmful chemicals and reusable materials from Ontario landfills. After each collection, the batteries are transported to Raw Materials Company in Port Colborne, Ontario where they are sorted by chemistry. A diligent sort is required because different chemistries are recycled using different technologies, and the contents of each are reused in different secondary applications. Raw Materials Company processes all of the alkaline batteries at its ISO 14001 recycling facility using its patented recycling technology that recovers 100% of each alkaline battery for reuse. Zinc, manganese and potassium account for approximately 60% of a typical alkaline battery. Those materials are recovered and refined to create micro-nutrients that are used in fertilizers to promote crop growth. The outer casing of the battery, approximately 25%, is made of steel and nickel and is reused as feedstock to manufacture new steel. “The recovery and reuse of these materials has effectively displaced the need to mine and refine the equivalent amount of resources from ore which has contributed to a significant reduction in green-house-gas emissions over the years,” said Cory Graper of Raw Materials Company. The remaining 15%, a combination of paper and plastic, is sent to an energy from waste facility where it is used as fuel to create electricity. The electricity produced from that paper and plastic is enough to power 80% of the entire recycling process. Ontario’s collection rate for single-use batteries has climbed significantly over the last 5 years. In 2017, the Province collected 50% of the batteries sold, one of the highest collection rates in the world for this material type. The vast majority of these batteries are still land filled in most states and provinces through out North America. 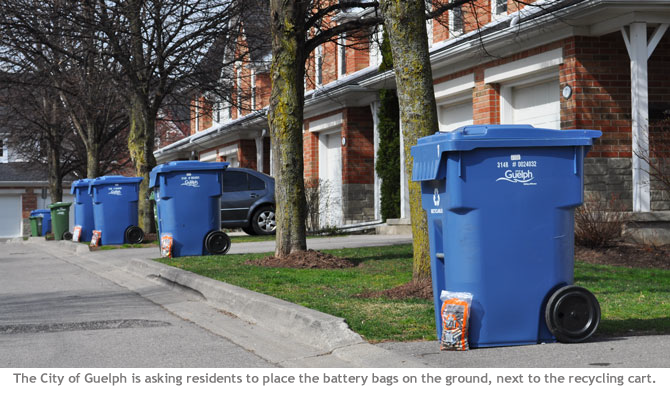 Curbside battery collections will run in a number of Ontario communities throughout the months of October and November. “Not all communities are participating in this program, so please check with your municipality before you put your batteries out to the curb,” said Graper. Raw Materials Company is an industry leading battery-recycling company. Established in 1985, RMC employs 50 people in the community of Port Colborne, Ontario. RMC is an approved transporter and processor under the Stewardship Ontario Battery Incentive Program which is funded by the battery manufacturers.